Urban Strides turn up the heat on a cold day at the Hemel Hempstead! 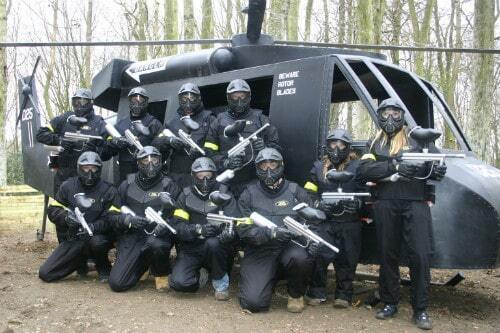 Coming to the end of another great paintballing year, Delta Force welcomed the latest dance crew to join in the festive paintball spirit and they certainly brought a lot of Christmas cheer with them. Having hosted Diversity at the Billericay paintball centre in the past, Urban Strides visited the Hemel Hempstead centre looking to step up to the plate and show their rivals how it’s done! Not only do they offer masterclasses and workshops in hip-hop choreography, they have also supported the likes of Dizzee Rascal and Sean Paul, with a performance at the prestigious Royal Albert Hall topping the list. The stage at the Hemel Hempstead centre may not have been as grand, but that didn’t stop them from warming themselves up with a minute-long impromptu dance, much to the delight of the other visitors and staff! Unsurprisingly, the marshals decided against challenging them with a routine of their own – they were much happier testing their shooting skills in eight of the most immersive paintball game zones to be found in the UK. With that much movement and energy on display, it was no wonder that their matches featured some high-intensity paintball action. Dodging paintballs was second nature, diving behind barricade after barricade was performed with flair and with so many hours put into practicing dance routines en masse, the players soon used their expert teamwork skills to decimate their opponents! The pilot in Black Hawk Down was rescued amongst a hellfire of paintballs, the flag was successfully defended from a determined enemy and quick feet and quick minds led to glory in the famous Black Pearl battle arena.